A snowstorm, a cowboy, and a woman with a gun make for an amazing Christmas read you’ll want to cozy up with. When Levi walks into the cabin to take shelter from a snowstorm, he never imagined he’d encounter a woman pointing a gun at him or a little girl hiding under a blanket. Once he realizes that she’s run her car off the road and is now stranded, his urge to rescue kicks in. Although Claire’s not the type of woman to let herself be rescued. 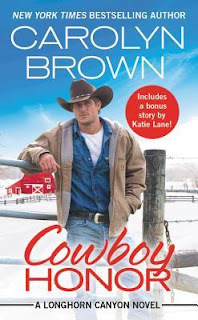 She’s used to being independent and she has her young niece, Zaylie, to care for but the longer she stays on the ranch and sees how Levi treats Zaylie and how close he is to those he was raised with she’s starting to realize being rescued isn’t so bad. She soon starts to realize there’s no point in denying her attraction and connection to Levi. When I pick up a Carolyn Brown romance, I know that I’m in for a treat. She knows how to evoke that warm, small town charm that makes me feel like I’m visiting old friends. I just cannot get enough. Levi is my favorite Carolyn Brown hero thus far. His mother left him with his adoptive parents at a young age so while he’s part of an amazing family, there’s still a part of him that questions if he fits in or not. He’s sort of missing that blood connection. While he has these questions, he hasn’t let that make him bitter. In fact, it’s sort of made him the opposite, he’s become someone who’s willing to fight for the strays be it people of animals. He has such a big heart and is so caring. Claire’s upbringing has made her independent. From an early age, she was the one everyone relied on and it’s been drilled into to the point she doesn’t know how to ask for help or really how to accept it once it’s given. It’s a big adjustment for her to have to rely on Levi and his extended family but she’s also smart enough to know that she can’t keep on doing all of it on her own. I liked that she was willing to let Levi into her life. The romance was so realistic. The attraction and chemistry was off the charts but I’m glad that they took their time figuring out what they wanted before acting on it. They got to know each other and themselves before hopping into bed and it made it believable. I have to say that Zaylie was the cutest kid ever and I loved that she kept her age appropriate. Often times when authors throw a kid into the plot they tend to act ten times their age so it was nice to see a four-year-old actually act like a four-year-old. She really livened up the book. Another thing I liked about this book was that Claire’s a quilter and I love how she’s expresses herself through her quilts and I felt like Carolyn did such an amazing job at showing the passion that goes into crafting a quilt. It also made me eager to get back into the quilts that I’ve been working on. Hands down, this is my favorite romance of 2018. It has everything that I love about romance novels: heart, heat, trust, family, humor, and cheer. I could not put this down and ended up reading it in one sitting. This is a let-your-tea-go-cold type of read.